Imagine that you stole $1 million per day starting Jan. 1 of the year 1 A.D.. By the Battle of Hastings (1066 A.D.) you're 18% through your crime spree; when the Pilgrims land at Plymouth (1620) you've finished 1/4 of your haul; when WWII ends, you've stolen 1/3 of your loot...finally in 5753 A.D. (3,734 years from now) you'll have stolen what Congress steals via its IRS scam... each year! Learn why tens of millions of Americans have walked away from Congress' D.C. al Qaeda. As was true of Lincoln's war, the two world wars were utterly devastating to the U.S. Constitution and rule of law in America. In all times and places, wars have been excellent diversionary tactics for tyrants and corrupt politicians. Colluding with mercantilists just before WWI, Congress took two actions that had an atomic impact on the American people: passing the manifestly illegal Federal Reserve Act, and defrauding Taxpayers about what the 16th Amendment accomplished.Congress has milked the Taxpayer population to transfer a trillion dollars (ostensibly in "interest") to those counterfeiters’ accounts each year. 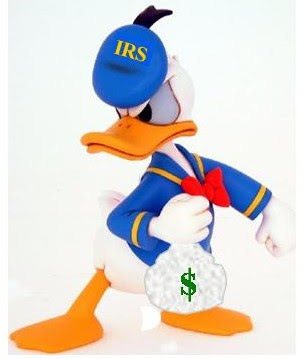 In the film, the "citizen's conscience" (narrator) rails at Donald Duck (the citizen doofus) and attempts to talk the viewer into making his quarterly, voluntary “victory tax” as a moral duty. Note the wicked transposition of morals: saving your money makes you a spendthrift...it's the moral equivalent of prostitutes and booze! But making your "fair share" payment to your dear, kind old "Uncle Sam"? That's virtuous living! That's an American! Those who assert Tom Brokaw's "Greatest Generation" was smarter than the average 18-year-old today, need to have their heads examined. As you watch the film, you'll be flabbergasted that adults could have been swayed by such bald, Soviet-style propaganda. Actually, not very many were. The tax industry and financial industry are two sides of a counterfeit coin, milking the productive people of America. The propaganda continues to roll off CPA's desks, Turbo Tax websites, your mortgage broker's blog, and financial authors who are just credible enough to fool most Taxpayers. The poster girl for this tactic is Wall Street author Amity Shlaes, a member of the Council on Foreign Relations and one of several extremely clever tax disinformation peddlers in the financial sector. Shlaes published a book in which for 250+ pages, she moans and flails her arms against "the system" while planting legal and historical disinformation. I want to comment on one excerpt from Ms. Shlaes book, The Greedy Hand: How Taxes drive Americans crazy and what to do about it -- but don't buy the book expecting to learn what to do about it. Shlaes offers nothing but the usual gripes about loopholes...then suggesting some of her own. Nothing about the Congress' fraud at all! [Shlaes misrepresents the facts here. Congress did NOT at that point levy a wider tax; they merely began misrepresenting the law as they expanded their original "soak the rich" plan. That original plan was the camel's nose in the tent, so that the average working man would entertain the idea of an income tax after the Supreme Court had shot down the Revenue Act of 1894. As former Rep. Phil Hart explains in his masterful history of the period, called Constitutional Income: Do You Have Any? -- first Congress represented the income tax as just for the rich. Some people swallowed it. Then, using the "war effort" as cover, they went for the wallets of average Americans. If the tax had suddenly become universal as Shlaes paints it, it would have been an unconstitutional taxation scheme, for which the US Supreme Court had slapped Congress' hand after the Revenue Act of 1894. It was still illegal to tax everyone. “Enter Ruml, man of [criminal] ideas. At Macy’s, he had observed that customers didn’t like big bills. They preferred making payments bit by bit, in the installment plan, even if they had to pay for the pleasure with interest....So Ruml devised a plan, which he unfolded to his colleagues at the Federal Reserve and to anyone in Washington who would listen. The government would get business to do its work, collecting taxes for it. Employers would retain a percentage of taxes from workers every week–say, 20 percent–and forward it directly to Washington’s war chest. “This would hide the size of the new taxes from the worker. No longer would the worker ever have to look his tax bill square in the eye. Workers need never even see the money they were forgoing. Withholding as we know it today was born. “This was more than change, it was transformation. Government would put its hand into the taxpayer’s pocket and grab its share of tax–without asking. “Ruml hadn’t invented withholding. His genius was to make its introduction palatable by adding a powerful sweetener: the federal government would offer a tax amnesty for the previous year, allowing confused and indebted citizens to start on new footing. It was the most ambitious bait-and-switch plan in America’s history. “Ruml had several reasons for wagering that his project would work. One was that Americans, smarting from the Japanese assault, were now willing to sacrifice more than at any other point in memory. The second was that the federal government would be able to administer withholding–six successful years of Social Security showed that the government, for the first time ever, was able to handle such a mass program of revenue collection. “The third was packaging. He called his program not ‘collection at source’ or ‘withholding,’ two technical terms for what he was doing. Instead he chose a zippier name: ‘pay as you go’… “The policy thinkers of the day embraced the Ruml arrangement. This was an era in which John Maynard Keynes dominated the world of economics. The Keynesians placed enormous faith in government. The one thing they liked about the war was that it demonstrated to the world all the miracles that Big Government could work. The Ruml plan would give them the wherewithal to have their projects even, they sensed, after the war ended. For the truth and accurate investigative journalism about the income tax and the corrupt mechanations in Congress of that day, forget Shlaes' book; read Rep. Phil Hart's book. Ms. Shlaes certainly puts on a good show for the uninitated, appearing to be disgusted at the income tax while actually covering up the real story: for us estimated 67 million non-filers, the war is over...we won. April 15th is just another day on the calendar for us. Congress is busted, and the mercenary Mr. Disney can't cover their tracks now; he's dead. “Everyone has to pay income taxes!” is the mantra of those who've defrauded Taxpayers for 97 years. Watch that 1943 propaganda cartoon as often as you must, to remember how corrupt the U.S. Congress has been since the launching of their 1913 Federal Reserve heist. So many Americans have died, all to cover the tracks of multi-millionaire criminals. WWI was the cover Congress needed to institute the Fed scam; WWII was their cover for making their IRS scam into every citizen's "duty". Or as the bumper sticker says, "Income Tax Withholding: A Temporary Wartime Measure Since 1943". Donald Duck, you're off the hook. Amity Shlaes, you're a cartoon.